Great easy wear baggy jumpsuit with elasticated shoulder straps - one size When on the jumpsuit hangs in folds, the outer corners fall inwards to make pockets on each side if that makes sense :) Bought in Morocco last year but never worn. 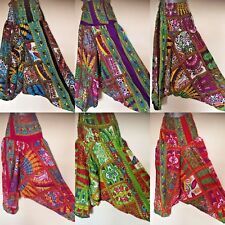 Womens Harem Pants Flowy Floral Boho Hippie Style Clothing Great Casual Trousers. New without tags. Raising money for World Challenge 2020. Useful and easy to wear black and white patterned casual wide leg trousers. Can be dressed up or down. Back elasticated waist with fixed tie belt. Two front insert pockets. Floral & animal pattern elasticated waist wide leg trousers. Machine washable with a matching tie at the waist band. Want your order even quicker?. One Pocket. 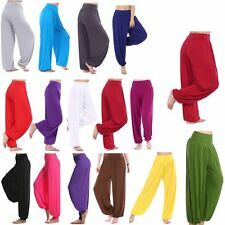 - Material : Premium Rayon (very comfortable and lightweight). 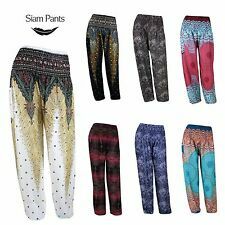 Hmong Hill Tribe pants Hippie Boho Samurai Trousers. 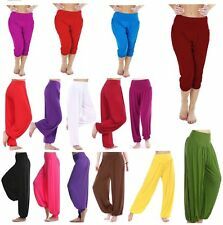 - Material : Premium Rayon (very comfortable and lightweight). Pia Rossini Bliss Palazzo Trousers. 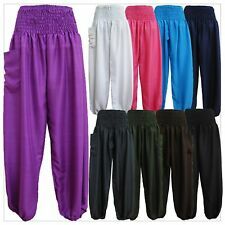 Pink Palazzo Pants with Tassle. Colour: Pink / White. Size: S / M. 100% Viscose. Elasticated waistband. Beige/taupe background with tiny daisy flower pink white black. Elasticated waist with drawstring ,side pockets. 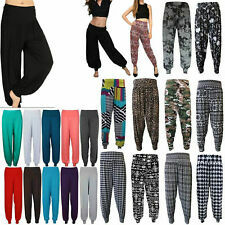 Crinkle multicolour trouser with elasticated top and elasticated bottom.